Brand value has become a buzzword in recent times and many managers, consultancies, and companies have started to pay closer attention to it. The fact that Madden, Fehle, and Fournier (2006) mention various published analyses that found a positive relationship between branding and the financial performance of a firm makes the application of a brand asset valuation model for any brand even more crucial. Here the analyses mentioned by Madden et al. (2006): Kerin and Sethuraman (1998); Barth, Clement, Foster, and Kaszkik (1998); Simon and Sullivan (1993); and, Conchar, Crask, and Zinkhan’s (2005). That is motivation enough for us to choose an established brand valuation model and apply it to a football club in the context of an exercise. We choose Everton F.C. because we have not used the Liverpool-based club in any of our exercises yet. At this point we must emphasise that the methodology is solely based on the author’s one-day research and occasional subjective observations in regard of the found information. Nevertheless, it is ‘good enough’ for the demonstrative nature of this exercise. In addition, Everton F.C. has had moderately priced season ticket prices compared to their city rivals Liverpool F.C. or other football clubs (dailymail.co.uk, 2014). Also, the fact that their average season attendance has been growing in the past 4 seasons is a further factor that can prove their strong differentiation attribute (evertonresults.com). Given the above information and further subjective observations of the Everton F.C. brand, we conclude that the club’s brand has developed a point of real differentiation in recent times. Unless a brand is relevant to a significant segment, it will not attract a large customer base (Aaker, 1996:307). In regard to brand content, Solis (2012: 101) claims that investing in relevance reinforces this new era of social consumerism, and that doing so improves the network, your place within it, and the reach and velocity of your role in the greater network effect. For this dimension, we will consider the factors ‘average attendance over the past few seasons’ – as in the differentiation dimension – and the ‘relevance score’ assessed through the Social Media in the Premier League document produced in 2014 by Accepted Socially with Matthew Carlton, Jonathan Madden, and Network London. As observed above, the average attendance at Everton F.C.’s home turf, Goodison Park, has been constantly growing for the past 4 seasons (evertonresults.com). This can be translated into a strong relevance amongst local fans. In terms of Everton F.C.’s online relevance, the Social Media in the Premier League document states: “Feeds go beyond the first team to keep fans abreast of news from youth and women’s sides and players out on loan, as well as highlighting Everton’s commendable community programme. Matchday commentaries on Twitter are lively, entertaining and go way beyond factual updates.” The documents grades the club’s relevance at 4.5, which equals 90% and the second highest only behind Manchester City and Arsenal. This equates to a rather high relevance on our scale. 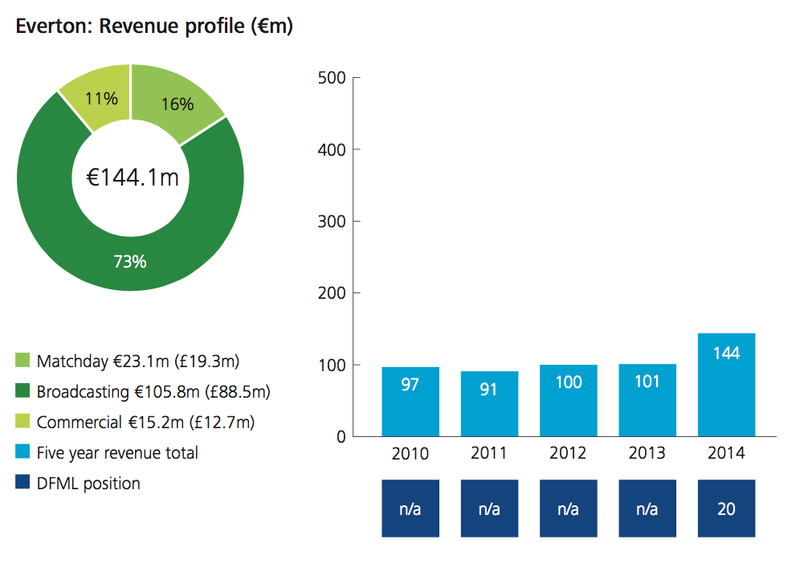 [I]t is fair to say that Everton’s financial performance has been improving. Up until the last two years’ profits, Everton had been consistently loss-making. In fact, they only managed to record a meaningful profit once in the previous eight years – and that was only due to Wayne Rooney’s big money transfer to Manchester United in 2004/05. Since the sacrifice of their youthful prodigy, the club suffered £45 million of cumulative losses between 2006 and 2012 before they found a solution to their financial woes – or, perhaps more accurately, Sky/BT signed a new television deal. According to the performance of the above-mentioned factors, we can attribute a high grade to Everton F.C.’s esteem. Knowledge indicates that the customer not only is aware of the brand but also understands what the brand stands for (Aaker, 1996:307). Bridgewater (2010:47) postulates that in professional sports awareness is largely down to the extent to which the club is covered by television and other media. Given that the Premier League is the world’s most watched league (premierleague.com, retrieved 17 May 2015), it is safe to claim that there is a good degree of awareness of the Everton F.C. brand spread globally. Furthermore, as we have discussed above, the club is doing a good job at sharing content through social media, which potentially increases the knowledge of their following about all-things Everton. Furthermore, Everton F.C.’s top20 ranking in the Deloitte Football Money League 2015, proves that the club is to be regarded as a serious and established brand within the sports world. 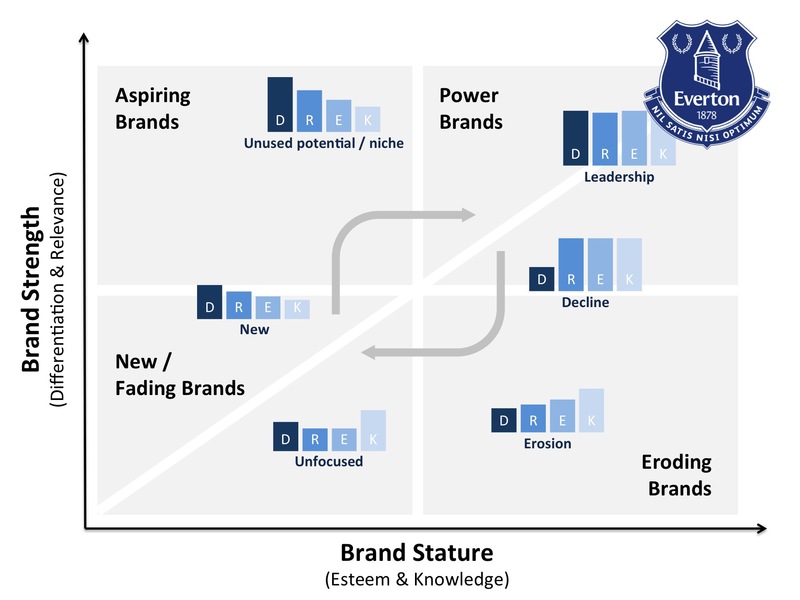 Assuming that there is a correlation between a resourceful engagement by the Everton F.C. brand in social media and the knowledgeability of its followers, we claim that there is a high degree of knowledge in this regard. In the above exercise we have assessed that the Everton F.C. 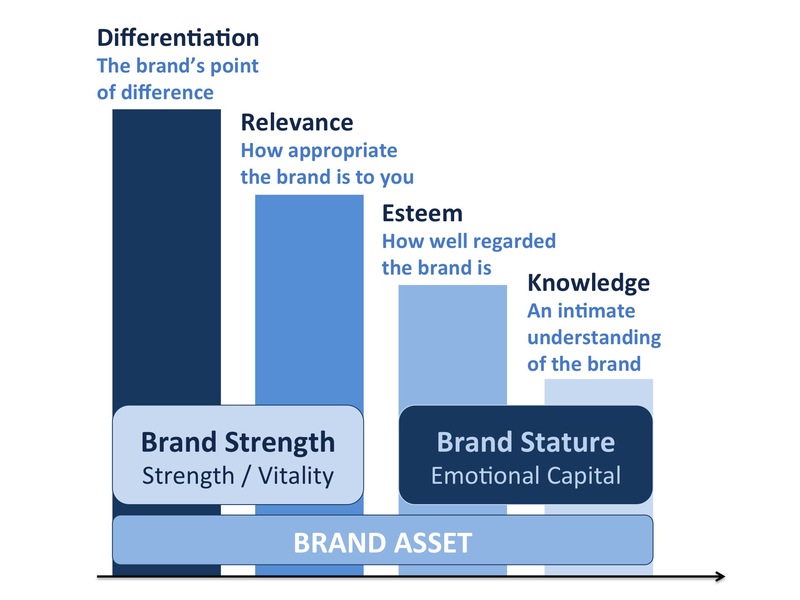 brand is strong in all four dimensions of the Brand Asset Valuator model. Hence, the brand ranks high in brand strength (differentiation & relevance) and brand stature (esteem & knowledge). This makes Everton F.C. a power brand with leadership characteristics. To keep its stance as a power brand, the club needs to maintain its differentiation attributes or else it will become less relevant, and therefore its brand will slowly erode. Such a decline might result in an unfocused brand that eventually will have to reinvent and reposition itself in a niche, before aspiring for new heights.